Whatever the time of year the last thing anyone wants is their boiler packing in. That's where our R.G.I. plumbing team can help can help. We offer an emergency boiler repair service which operates 24 hours a day, every day of the year. Our R.G.I. plumbing team aren't just specialists in power flushing. We carrying out all works with natural gas as well as standard plumbing. If you are unlucky enough to have your boiler breakdown we have engineers who will come out at the drop of a hat. Some of our staff have over 30 years experience in the plumbing trade. Some good reasons to call us when you need an emergency boiler repair? We are a respected company. We deal with some of Dublin's largest property management companies and are a social housing contractor. This means we always have R.G.I. plumbers out and about throughout the county at all times. You will always get an answer when you call. Our polite office staff will always do their best to get someone to you within a couple of hours, often faster (traffic dependent) day or night. We don't charge for call outs! Our charges only start when we arrive and start to diagnose/repair the issue. We price fairly with all quotes upfront. We don't add hidden fees or charges. This means the agreed price won't change from the outset. We will only dispatch fully qualified R.G.I. plumbers for your emergency boiler repair. All completed work comes with a minimum 1 year parts and labor warranty. Five years for new boilers. We are comprehensively insured with both professional and public indemnity insurance. Our staff are polite and reliable. They will always be 100% fully focused on giving the highest standards of workmanship possible. Our staff carry out boiler repairs, boiler servicing and installations on a daily basis. If your boiler packs in unexpectedly call us on 01-6874853. 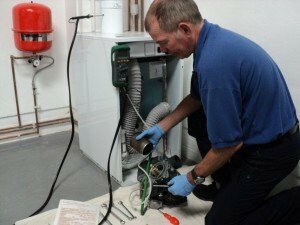 We will dispatch an emergency boiler repair engineer straight away.